What is the minimum number of hosts for VSAN? This is one of those discussions which is difficult… I mean, what is the minimum number of hosts for vSphere HA for instance. If you ask anyone that question then most people will say: the minimum number for HA is 2. However, when you think about why you are using vSphere HA then you will realize pretty quick that the actual minimum number is 3. Why is that? Well you can imagine that when you need to upgrade your hosts you also want some form of resiliency for your virtual machines. Guess what, if you have only 2 hosts and you are upgrading 1 of them and the other fails… Where would your virtual machines be restarted? I can give you the answer: nowhere. The only host you had left is in maintenance mode and undergoing an upgrade. So in that case you are … euhm screwed. Now lets looks at VSAN, in order to comply to a “number of failures to tolerate = 1” policy you will need 3 hosts at a minimum at all times. Even if 1 host fails miserably then you can still access your data because with 3 hosts and 2 mirror copies and a witness you will still have > 50% of your copies available. But what happens when you place one of those hosts in maintenance mode? Well I guess when both remaining hosts keep on functioning as expected then all VMs will just keep on running, however if one fails… then… then you have a challenge. So think about the number of hosts you want to have supporting your VSAN datastore! I guess the question then arises, with this “number of failures to tolerate” policy, how many hosts do I need at a minimum? How many mirror copies will be created and how many witnesses? Also, how many hosts will I need when I want to take “maintenance mode” in to consideration? Very good read! Maybe you should promote VSAN as a RAID6 solution, needs 4 “data hosts”, works fine with 3 and with reduced performance also with 2 “data hosts”. 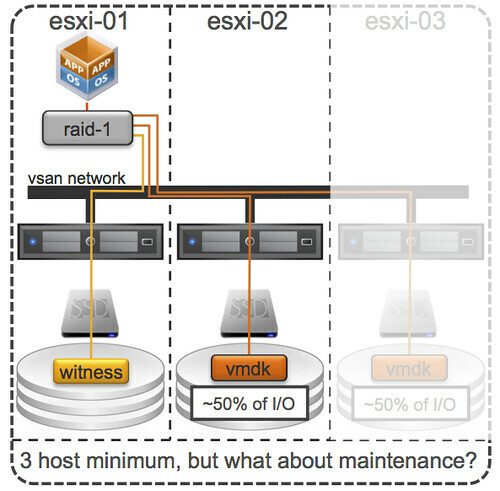 2 hosts = reduced availability… performance could be roughly the same. Will you post some numbers & figures after GA of VSAN? Would be great! Yes, to give us an impression what “performance could be roughly the same” means in numbers. It’s always good to know how much performance a degraded systems gives to your application(s). so many variables there, that will depend on: number of hosts in your cluster, number of failures, objects impacted, blocks impacted and accessed. that VSAN doesn’t work as a vMSC solution. Or is there a way to create a “witness vm” which only acts as a witness (like the Lefthand FOM)? Thank you for writing this particular article. what about this idea?? –> Many companies with only 3 hosts might only ever put a host into maintenance mode, 1 at a time, for performing remediation/updates via VUM, which usually requires a reboot. This often lasts 15-30 minutes per host. If one did one host per day or one host at a time, this would mitigate the risk, provided other things were taken care of, such as redundant power supplies, UPS, backup power generalor, etc. Your +1 for maintenance does not provide for real tolerance. If you take one of the copies for maintenance and your only working copy fails, then you are kaput even if you have 4 hosts, because you would not have had time to regain redundancy. If I have 4 hosts, and place it in to maintenance mode and tell it to move data then 3 hosts will hold your components and a witness. So even if a host would fail in that scenario during maintenance mode… it would work fine. Hey Duncan – sorry for resurrecting an old thread, but when you say “and you tell it to move data” do you mean the “Ensure accessibility” or “Full data migration”? full data migration is the only way to “move all” data out.